Description:Members of the Furimon clan are typically known as trouble makers, constantly butting heads with enforcers of the law. They are allowed to continue to survive as members of society due to their willingness to cooperate with the influence of money and their prowess in the art of combat. In times of conflict, the Furimon clan typically expect to see hefty financial gain allowing them to avoid working in times of peace. As a result, when times are peaceful, members of the clan who choose not to work as shinobi become lazy and complacent. 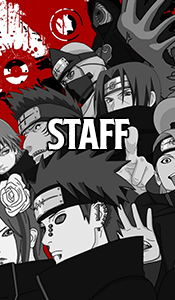 Members who become shinobi are typically looked on as the heroes of the clan. Special characteristics/traits: Members of the Furimon clan are characterized by their darker skin tone, as well as their extremely thick dark hair which they typically put into dreadlocks in order to tame it. History: The Furimon clan was not originally a staple in the village hidden in the mist. The Furimon clan started out as a group of mercenaries working for the Mizukage. The Mizukage was very generous to the Furimon clan, giving them enough pay for their work so that they wouldn't have to do any work at all outside of their fighting for the village. As a result, the members of the clan began to become greedy, demanding more pay for their work. Pressured, the Mizukage complied with their demands, giving them more money than ever before. With even more money, they began to get lazy, since they didn't need to do as much work to get the same amount of money. Over time they got even lazier. So much lazier in fact, that even with their combat prowess, they sat out of the Fourth Great shinobi war because the Mizukage didn't believe they should be forced to pay someone to help save their own life. And so, the stubborn Furimon clan merely watched as the rest of the world's shinobi waged war, waiting to either be paid or for the world to end. Unfortunately for the Furimon, the 4th Great Shinobi war was won without their aid, and the Mizukage was not friendly to the clan that was so greedy they'd actually let the world end than work for free. Previously, through their mercenary work for the village, the Furimon were able to sustain themselves comfortably without doing much else.Now, with peace all over the world, and the Mizukage not willing to pay them for the little amount of work that was available, the Furimon clan were forced to live in poverty. With no real skills outside of combat, the Furimon were forced to rob people attempting to get into the village, using the mist as cover. For 100 years the once respected Furimon clan were reduced to petty thieves and bandits. This continued throughout the entire 100 years of peace following the 4th Great Ninja War. Finally, when Iwagakure attacked, the Mizukage was forced to call on the Furimon Clan for the first time in a century. Paying them enough to lift them out of poverty, the Mizukage would once again be backed by the Furimon clan, and with their help they'd have an advantage that wasn't present during the Great War, and be able to surprise the rest of the world with their strength. Now, the relationship between the Mizukage and the Furimon clan and the Hidden Mist Village is better than ever before, with the mercenary work being done efficiently and at a much more reasonable price than before. Bloodline description: The chakra of the Furimon Clan is unique in its ability to physically solidify, allowing them to form a sort of chakra armor around their body. The Furimon Clan's solid chakra is traditionally a vibrant blue color, and it's density and strength is directly proportionate to how powerful the chakra of the user is. The armor can either be formed around specific body parts, or over the entire body once the user is capable of sustaining it. Bloodline weaknesses: To activate the ability the user must stop moving temporarily, the user cannot utilize ninjutsu while the armor covers their entire body. Description: By charging their chakra in one post, the user can use their physically solid chakra to form a sort of full body armor around themselves. This technique can be sustained as long as the user has the chakra to sustain its use.